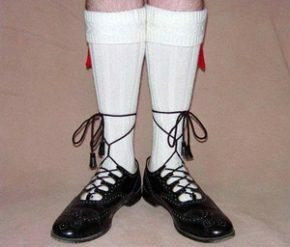 Whenever I gave a talk on Highland dress in the USA and spoke of the white stockings (hose) that one so frequently sees worn with the kilt, I would – in the manner of an old-fashioned southern preacher – boom: “White hose is an abomination unto the Lord”. That usually grabbed attention and hopefully lodged the pronouncement deep in the psyche of all the kilt-wearers present. A bit of history . . . ‘hose’ is rather an archaic word from the 15th century that has attached itself to the long socks or stockings worn with Highland dress. It originally referred to any of men’s one-piece clothing for the lower body and legs. By the 16th century it had evolved into two separate garments: upper hose or breeches and nether hose or stockings. That was further truncated to hose but by the 17th century, the word had fallen out of favour in preference to stockings – except in Scotland. The old plural was hosen but now hose serves as singular and plural. Sticking to its origins, the German hosen still means trousers or pants. Most Highlanders went around bare-legged and bare-footed but when they did start wearing hose, it was made of cloth, usually woven in a red and white check called cath dath (pr: kaa dah) – war pattern. It was cut on the bias (diagonally) to give it some elasticity, and seamed at the back. The tops of that early hose stopped well below the knees – on the thickest part of the calf – and, despite being secured by various forms of garter, frequently fell down. They were subsequently replaced in the 18th century by knitted hose which clung to the legs much more effectively. 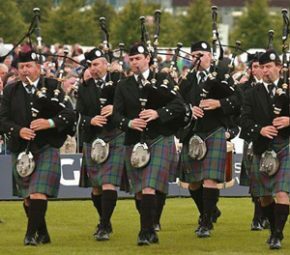 The origin of white hose lies with the British army and the white spats or gaiters that many regiments still wear ceremonially – especially their pipe bands and more so, their civilian equivalents. The spats were originally gaiters or leggings worn mainly by infantrymen to protect their lower legs and ankles and to keep sand and grit from getting into their boots. They were also an effective means of covering the gap left by footless hose (called hose tops). For ‘dressy’ occasions, those gaiters evolved into the smaller white spats which, in Scottish Regiments, reached halfway up the calf. White hose effectively cuts a kilted figure off at the knees and destroys what could and should be an extremely attractive and co-ordinated outfit (ask your women-folk of you don’t believe me!). Thankfully, of late, the good-taste fairy has shown signs of overcoming the wicked white-hose genie and many kilt wearers have seen the light and are choosing self-coloured hose that more elegantly tones in with their kilt. Thanks Guys! I have to say that your selection of kilts is eye-splatteringly amazing! Full marks for your ‘work kilts’ but don’t let anyone bring a naked flame close to those cheap tartan ones – if they come from where I think they do, they’ll go up in flames pretty damn quick.